This leak-proof collapsible cooler can hold up to 50 cans then fold down to a three-inch layer. Equipped with a built-in bottle opener, nifty outer pockets, and durable handles, this cooler keeps your drinks cold up to 36 hours. 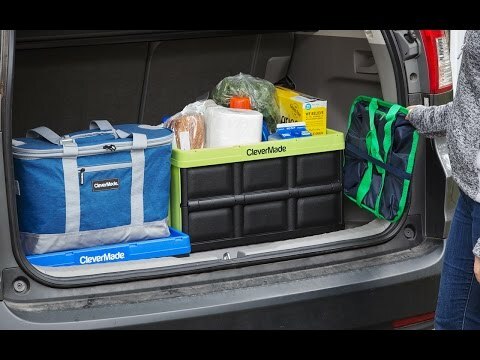 Snap to collapse it flat and avoid a bulky container when you return from a tailgate or camping trip. Dimensions: Collapsed: 18.3" x 12" x 3" Open: 18.3" x 12" x 11.75"
Great cooler for the car! These robust, collapsible storage containers slim down to a thin, foldable layer. 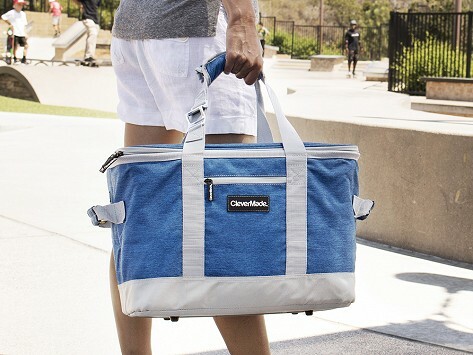 CleverMade’s durable baskets, crates, and coolers are sneaky helpers—taking up minimal space when they’re empty. Functional and space saving, CleverMade crates can hold lots of weight and give you a good hold on anything from bulk shopping to sports gear. Their baskets pop up to hold your groceries and don’t spill or tear like reusable bags. And their clever cooler keeps your drinks cold up to 36 hours then flattens into a three-inch sheet you can slip in anywhere. Load them up with groceries, pack for a tailgate, or prep for a trip to the park—then collapse and lock. Keep them in the car or closet and they’ll stay undercover.